Our job is to make you win. Instead of just taking orders or selling you services, we work as a partner. While you know your business better than anyone else, we learn about your company, brand, challenges, objectives, and goals to better armed with helping you succeed. We are relentless with results. Armed with a strategy, we map out a game plan to meet your goals. 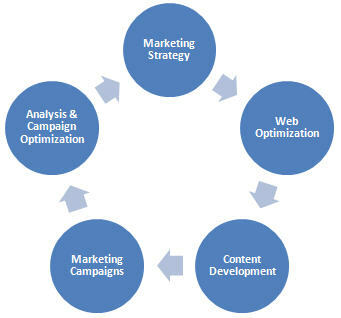 Marketing campaigns are continuously measured, analyzed and fine tuned to optimize performance. Starting out with a marketing strategy is the first and most important step in paving a roadmap to meet your business objectives and deliver results. Your marketing strategy maps a plan on how to make your business succeed. Most importantly, it takes into consideration existing and required resources to achieve your sales, revenue and customer goals. With the constant flux and changing dynamics of the Internet, your web presence requires continuous optimization to gain visibility and acquire traffic to your website and more importantly to meet your web marketing goals. How do you and what should you communicate to your target customer? Content is the bolts and nuts of your online marketing, fastening all the parts - words, imagery, sound, and colors that delivers the right message at the right time with your target audience about your business and brand. Ongoing strategic content development is essential to attracting and engaging your prospects and optimizing your Internet and search engine visibility. We help devise and implement your content marketing plan to continuously create, manage and optimize your message. Knowing how, what, who, where, and when to reach your target audience and customer are key to creating and launching the right marketing campaigns for your business. As soon as your marketing campaign launches we start to collect and measure its performance. We take a deep dive into the hard numbers and analyze the return on your marketing and advertising spend. Working with you, we then decide and execute the best course of action - tweaking and refining the campaign or making other changes to meet your marketing goals.